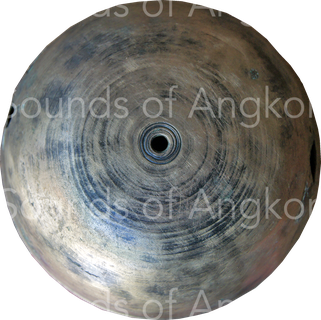 Bell tree - Site de soundsofangkor ! 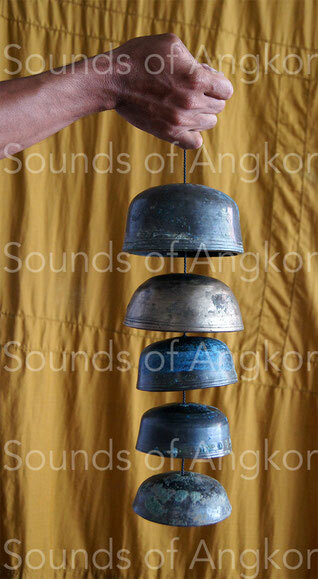 In the Angkorian period, there are bell trees with five elements (the most represented) and others with three (a single example) portable or suspended in a fixed manner. The iconography and the objects arising from archaeological excavations attest it. 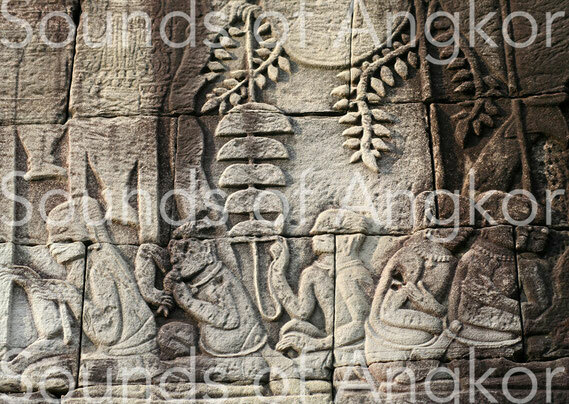 On the bas-relief of the Historic Procession of Angkor Wat, two Brahmins carry a tree with five bells of the left hand. The bells are mounted on a flexible shaft. The Brahmin in the foreground holds, with his right hand, a striker consisting of a handle surmounted by a cylinder with braces, perhaps a plaiting in basketry or a cloth. The game probably consisted in hitting the bells up and down in a sliding movement. Brahmins carrying bell trees. Angkor Wat, south gallery, Historic Procession. 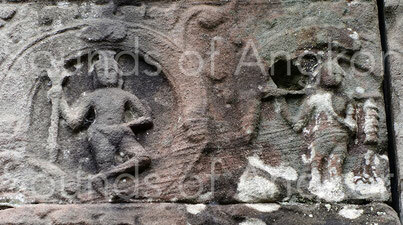 12th c.
This bas-relief presents two characters of Hindu religion. The one on the left holds the trident of Shiva and the one on the right carries a pair (?) of five-bells tree. 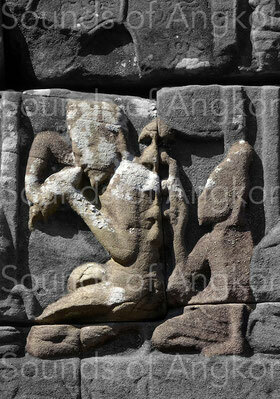 Preah Khan of Angkor. The south external gallery of Bayon offers us another representation of bell tree with five elements. Here, a small external clapper is attached to the link crossing the bells. It will be noted that in the illustrations and the play of the instrument is associated with that of the conch. 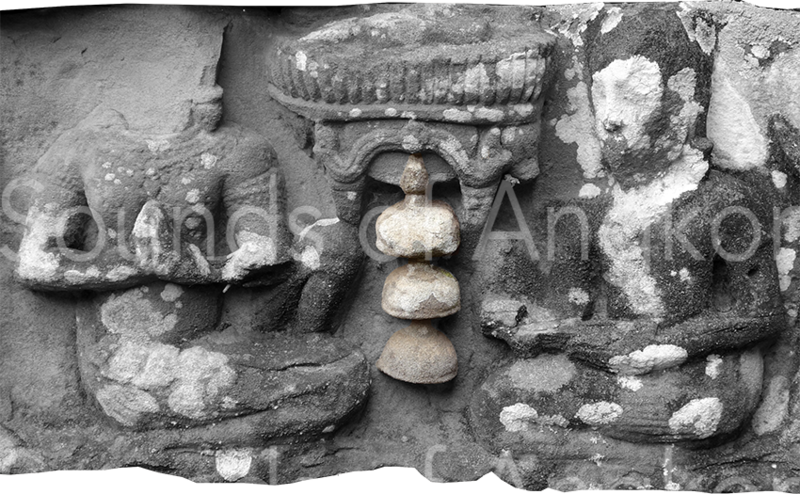 The east external gallery of Bayon offers also an association between a bell tree and the conch. 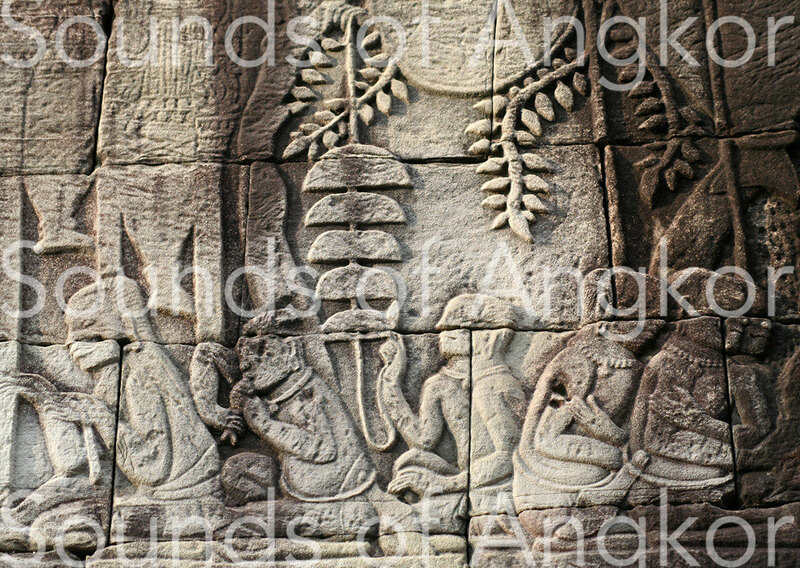 The only representation of a three-bells tree originates from the Bayon, a high relief stacked among other blocks in the northwestern courtyard of the temple. It does seem complete as well. Recall that the Bayon was a Buddhist temple. The five bells have a Hindu symbolism. The three bells could then symbolize the three refuges of the Buddhism: Buddha, dharma, sangha. Three-bell tree. The lower element seems to oscillate under the action of the clapper. Bayon, north-west courtyard. 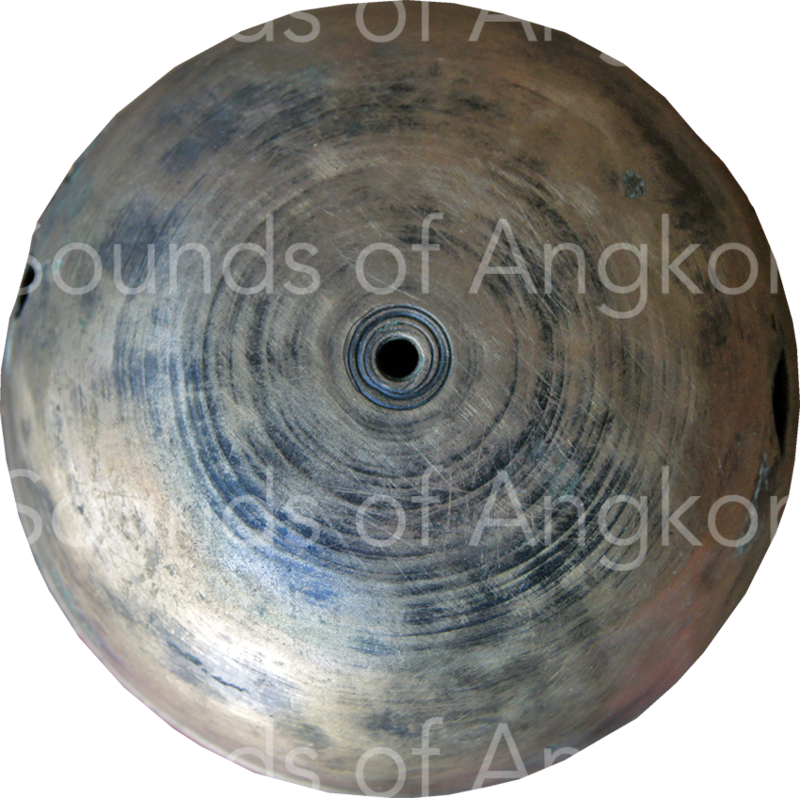 Thanks to scattered bell-tree elements from archaeological excavations at the Vat Bo archaeological repository in Siem Reap, we were able to reconstruct the instrument and make it sound (opposite). We have assembled three bells of the same making appearing to have belonged to the same instrument. We added two more disparate bells. This instrument is still known today in India with bells organized along a rigid axis. It consists of a variable number of elements ordered of size, but without seeking a particular tuning. Bronze bell tree element. The concentric lines may indicate that each element was machined by their lost wax cast to tune them. This is not always systematic. Archaeological center of Vat Bo, Siem Reap.